Check first, to see if it’s salable. Turn it into a pillow. Sew the sleeves and bottom edge shut, then stuff with fiberfill. Trim away the sleeves, cutting slantwise, for a new tank top look. Or cut away the sleeves, plus the upper back, leaving the neck intact. Voila – a hipster halter. Want an even easier bedcover or snuggle quilt? Cut away the back of each t-shirt, taking care to trim just outside the side seams, so the t-shirt’s raw edge automatically folds under. Cut a sheet or waste piece of fabric to the size you want. 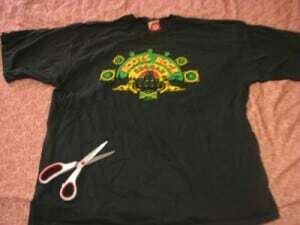 Now position and stitch the t-shirts in place, sleeves and all, overlapping as you go. (The example I saw filled in any open areas with bright-colored socks. Use a mix of children’s and adults’ shirts for better contrast.) This can be top-stitched by machine, or whip-stitched by hand – your choice. Add an additional backing, then bind the edges. Sort your t-shirts by color, cut them into strips and crochet a rug. A good basic pattern is here, from My Messy, Thrilling Life. Turn it into a soft polishing or dusting cloth. You’ll find 100 different ways to use your t-shirt on this wonderful link. They sell all sorts of t-shirt styles at interesting prices. Thanks! I use my old clothes to clean the floor. But last time I had one that love it so much, created a beautiful hair clips with it. Usually old shirts go into the rag pile but I like the potholder idea.